As "Alpacaholics" we like nothing better than the opportunity to talk about alpacas and llamas, sharing with others why and how they became our passion. We would like to tell you about their history, little nuggets of information like there are no alpacas in the wild. And to give some insight into rasing them, their care and their prime reason for being - their fabulous fleece, only Inca royalty could wear fabric made of alpaca. Bring your group to come and see us here or we can come to see you at your place. We woulld like to invite you to take advantage of our setting, the glorious alpacas and our knowledge by offering illustrated talks. They can be adapted for all groups from Brownies and Cubs, the WI and Inner Wheel to Young Farmers. Our talks cover all aspects of the alpaca from their ancient origins in South America to their place on the modern farm and as fleece producers. Our talks are fully illustrated with slides of our own alpacas, and we have many stories to tell of their quirky personalities and the ups and downs of living and working with these delightful and sometimes infuriating creatures. We can include a demonstration of felting techniques. Examples of raw and prepared fleece, knitted/crocheted and felted goods and yarn will be on display and available to purchase. We are also available to come to your meeting. We are able to bring laptop, projecter, screen and extension cable plus examples of our fleece products. 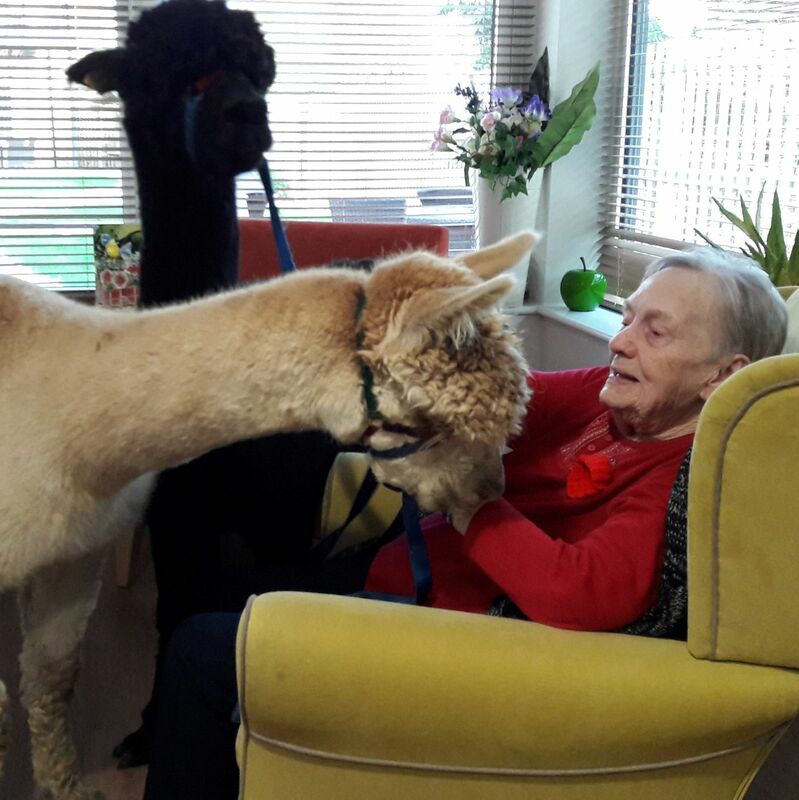 We can bring our alpacas and llamas to schools, colleges, residential and nursing homes to provide an different experience for pupils, residents and staff. Not only are they entertaining but feeding and stroking them will provide a talking point to encourage even the quietest individual to open up and engage in social activity. We can also bring along a variety of products from raw and prepared fleece and yarn to knitted and felted items to add a sensory dimension to the experience. We are fully equiped with hurdles so we are able to create a meet and greet pen at your location (A patch of grass is preferred but not mandatory). We will clear up and remove any "alpaca beans" deposited during the visit - unless of course you would like to keep it for the garden, it is a most excellent soil conditioner!! School groups are welcome for meet, greet and feed sessions, informative talk and a fibre felting session. 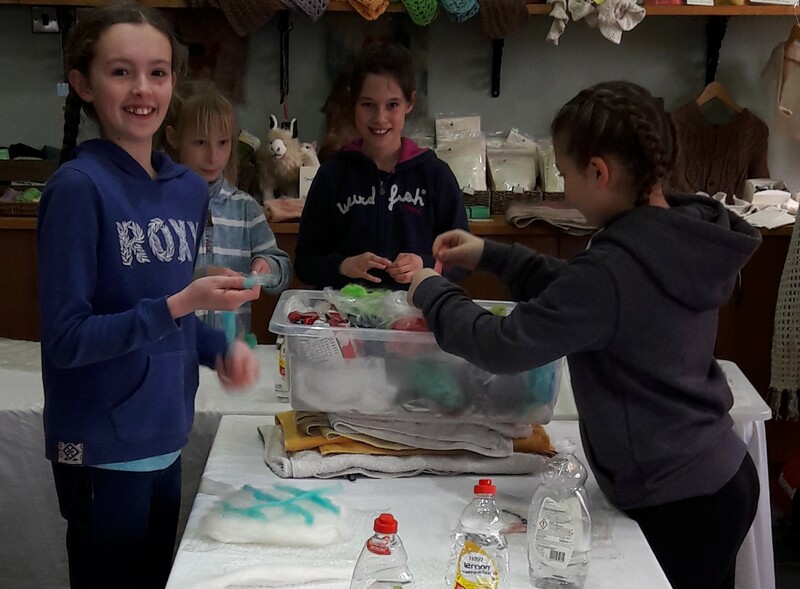 Victoria is also available to bring a felting session into school.